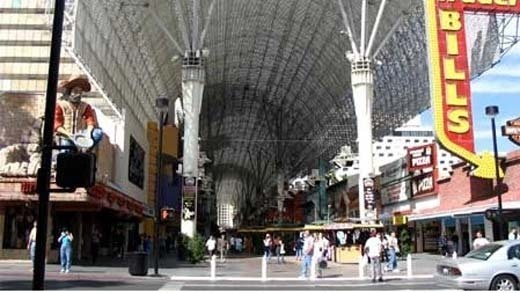 Remember the Fremont Street light show that had a fighter jet roar past overhead? Me neither, I just saw a photo on the internet. Everytime I've gone recently I see that country music extravaganza. But the jet picture captured my imagination. It just seems like a lot of fun to zip along under that giant canopy, waving at the pedestrians on the ground. And finally, somebody made it real. Greenheart Conservation Company, responsible for the ziplines by Boulder City, has set up a thrill at the Fremont Street Experience. Riders can depart from the roof of the parking garage and slide 800 feet through the crowded entertainment area, to a landing platform 14 feet off the ground. The lines and towers now in place are temporary, but the plan is to make it a permenant installation, and lengthen it, too. Greenheart co-founder Ian Green, hopes to create a zipline down the entire length of the Fremont Street Experience. In case you don't know, a zipline is a steel cable hung between two towers of differing heights. Riders strap themselves into a harness dangling from the cable at the highest tower, step over the edge, and let the cable zip them along over forests, trails, rivers, and waterfalls. The ride can be 50 feet or 2,000 feet long. Greenheart Conservation Co. has ziplines in place in Bootleg Canyon near Boulder City, in Haiti, San Diego, and British Columbia. This is the first zipline experience I've ever heard of over a heavily populated tourist area. The zipline on Fremont Street is on the cheap side, at $15 before 6pm and $20 after. Re-rides are five dollars less and include front of the line privileges. Fremont Street Flightline First Flight from Fremont Street Flightlines on Vimeo.